This easy-to-use service allows customers to find the density value of any product; it immediately defines the density of more than 1,700 different products, liable of bulk manipulation. Once the product is chosen, the system shows the best machine for the task, along with technical file specs, pictures and videos of similar machines. 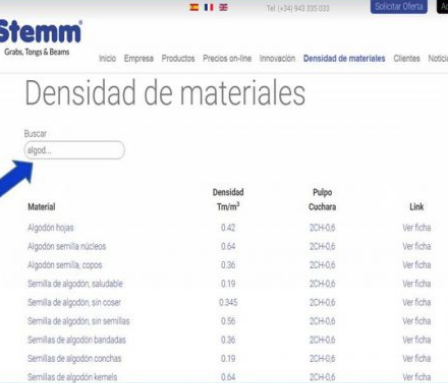 On STEMM's website there is a tab reading: Density of materials. Click, and you will access a page, in which you can be written in the box the denomination of the product you are going to handle… the predictive definition will be activated, and you will be shown a list of similar words, including the word you started writing. Density of the chosen product (t/m3). Whether handling is done with a clamshell clam or an orange peel clam. A technical file with 5-6 pictures and 10-12 videos of similar machines working with similar products is shown. This service will give you a complete idea of the machines you are looking for and that you need to fulfil your requirements. Additionally, a complete technical-economic offer can be sent to you immediately.